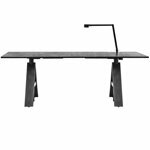 Leap is an entry level electrically adjustable range of desking comprising of a single stand-alone desk & bench desk. Our frames can be manually expanded to accommodate tops from 1200mm to 1800mm in width and electronically adjusted from 655 to 1255mm in height, all at the touch of a finger with the touch-sensitive controls. Comes with Memory Master Control function.